Electric Skateboarding is an experience in itself which has fascinated us from years long, but due to lack of technology our whims were still getting suppressed. Well, not anymore. Introducing the Buffalo F Smart Light Electric Skateboard, in the Buffalo I Wonder series, that makes your commute in the city throughout the trickiest parts extremely easy and exhilaratingly fun. It comes with the phenomenal dual powered motor system that gives you the awaited boost at your convenience. It allows you to accelerate through hilly or wet regions also. Very tough and reliable, Buffalo comes up with the cordon bleu among quality parts. 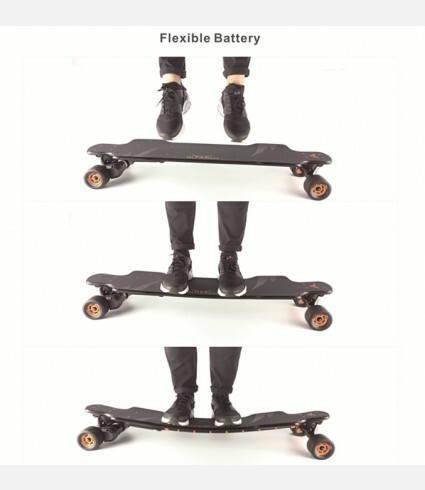 Is Buffalo F Smart Light Electric Skateboard Safe? 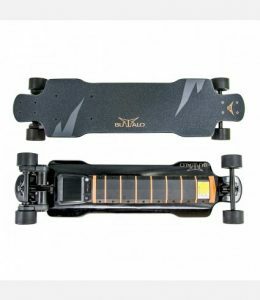 Is Buffalo F Smart Light Electric Skateboard Worth the Cost? The deck of the board which is made using four layers of bamboo material and four layers of fibre glass ensures toughness and guaranteed durability over rough terrains. It is built keeping in mind flexibility, stability, hardness and light weightiness benefits. More traction on the deck for the users ensures their feet stay at the right place at all times of the ride. The wheels made with PU, give 85% rebound and 85 A hardness. They are also available in various exciting colours like Orange, Green, Red, Blue and Black are durable, water proof, dust proof and shock absorbing in nature that guarantee a hassle free and comfortable ride through the trickiest parts of your city. Weighing 17 lbs and with the dimensions being 38.4 * 9.4 * 5.5 inches, the Buffalo provides you with a peppy and easy to use electric skateboard which can carry a maximum load of 120 kilograms. The skateboard has also been tested for gravel and wet regions and works perfectly fine there too. The elastic deck board that comes with it, ensues for a stable yet compliant ride along the roughest parts of the city. With 22% incline available, it is also extremely convenient for hilly terrains. The bamboo plus fibre glass exterior, guarantees toughness, light weightiness and durability all at the same time. Containing DC Brushless motors with hall sensors and world’s only single dual drive system, the Buffalo F Smart Light Electric comes with a 1200W powered motor. 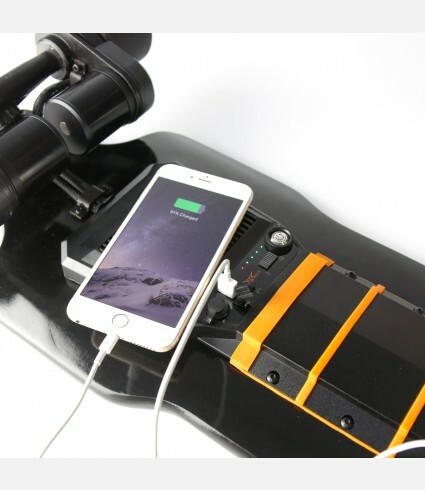 The battery incorporated within has the type LG 185650 Lithium powered with capacity 29.4 V and 6.6 Ah which means you have got to worry no more about re charging your skateboard anywhere between your commute. It takes up to 3 hours to get fully charged. You can rush as fast as up to a maximum of 40 km/hr. Pepped up with a 22% incline uphill grade capacity, you can tread along hilly slopes with no difficulty at all. The Bluetooth enabled radio controller offers 2.4 Ghz and the capacity to remain charged for up to 2 hours. The stand by time for the controller is up to a whole month. Having made with keeping safety as a priority before fun factor, the skateboard comes with Regenerative Braking Feature that helps you stay safe on the roads. It comes with 3 different riding modes– Beginner, Advance and Cruise modes that enable you to shift along your preferred one as per the road scene in front of you. The method of shifting from one mode to other is also quick and responsive. The extra traction on the deck makes sure your feet stay in the right place while riding. Dust proof, water proof and shock absorbing PU wheels with 85% rebound help your Buffalo F Smart Light Electric Skateboard to stay on the right tracks. Originally priced at around $999.9. For the features that come along with it, once you set out on your first ride on the Buffalo F Smart Light Electric Skateboard will actually make you feel proud of the money you spent. Clubbed with a warranty of 1 year and a risk-free guarantee of 6 months, this skateboard dissolves all your worries of money spent on damage control too.